Over at Double Delights the challenge this week is to emboss it, I'm not sure if you can see the embossing on my card to well, but it is there, this wonderful digi stamp is, of course, from Faith's Designed 2 Delight progressive challenege,where everyone who playes wins. Why not go by her shop and see other great images. I'm also entering this card into Paper Sundaes, lots of layers challenge, they are being sponsored by Sugar Nellie this week. This card will also be entered into Priscillastyles Midnight Madness sketch or MMSC62, I saw this sketch and fell in love with it. I new it would be perfect for these challenges. The sketch challenge is being sponsored by Paper Temptress and Sew Many Cards. A BIG WARM WELCOME to the Midnight Madness Sketch Challenge!! We are so happy that you have found us and elected to play along. You card is very lovely, love the soft colors and embellishments. The MMDesign Team thanks you for joining us this week. Pretty! What did you use for coloring the flower? It's really shiny! Great papers too! Howdy "DQ"!! A big WELCOME to The Midnight Madness Sketch Challenge. 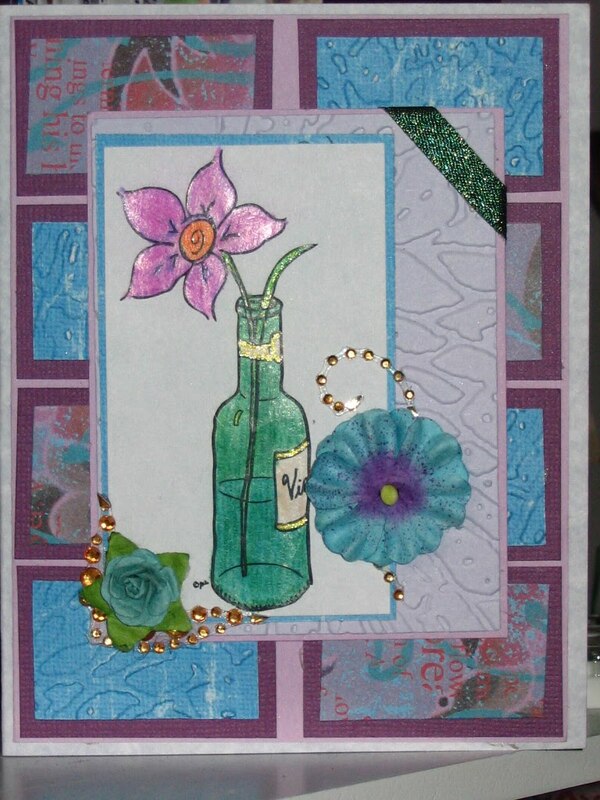 Ooooh, I LOVE all the sparkle and glimmer of your card and also your choice of dp, bling swirls and flowers. This is one incredible creation! Thanks SO MUCH for joining us in The Midnight Madness Sketch Challenge this week and I hope you can tune in and play again next week! Very pretty. Great take on that MM sketch, it was a tough one! Such lovely colors, too. Thanks for playing along at Delightful Inspiration this week. Greetings and Salutations from the Midnight Madness Design Team. Welcome to our challenges, it is so nice to have you. Your card is just delightful. I love how it sparkles and shines. So pretty with all your extra added touches. Great job on the sketch this week. Thank you for playing along with us at the Midnight Madness Sketch Challenge. Gorgeous! Love all the colour. Thanks for playing at Paper Sundaes. Hi, love your card. All the shine and shimmer is wonderful. Thanks for joining us at Double Delight. Velcome to the Midnight Madness Challenge! We are so happy you found us and wanted to join in! Your card is a sparkeling delight! Love the colors and the texture! Thanks for joining Midnight Madness Challenge. We appriciate your support and hope to see your faboulus work next week also! Hi!! First off...Welcome to the Midnight Madness Sketch Challenge!! I absolutely LOVE your card!! The colors are beautiful as well as the dry embossing!! I love the way you added shimmer to your image!! Thank you for joining us at the Midnight Madness Sketch Challenge this week...we sure hope to see your beautiful creations again next week!